The CAP500 stage is designed to heat and cool capillaries from -196°C up to 500°C. It can control the temperature of a ≤50mm section of high pressure (up to 600bar) quartz capillary.. The capillary is inserted through the body of the chamber and housed in a 1mm x 0.6mm rectangular channel within a silver heating block. The block itself has been designed and engineered to minimise the temperature gradient across the length of the capillary and can provide accurate temperature readings to 0.1°C. Capillaries which are loaded into the channel can be moved using the control mechanism to allow for observation across the length of the sample in the capillary. The CAP500 is suitable for capillaries with an outer diameter of ≤0.6mm. If you require use of different size capillaries, contact us as we may be able to provide a solution. 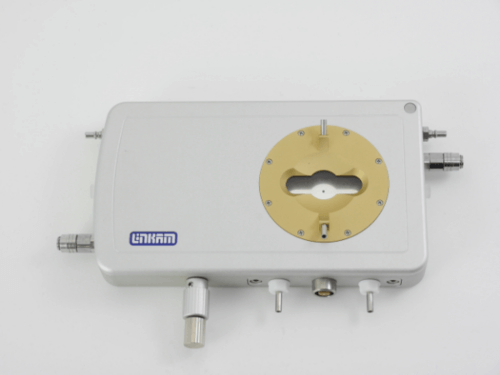 By using high pressure pump and pressure gauge it is possible to pump samples through the capillary at a specific pressure to investigate the rheology of the sample with respect to temperature and pressure using brightfield, IR or raman microscopy. The CAP500 stage has also been used to study geological fluid inclusions created in quartz capillaries.